Get your golf shoes ready and sign up for the 32nd ALPHA House charity golf tournament! Enjoy socializing and networking with local professionals and community leaders as we raise awareness for such an amazing organization. 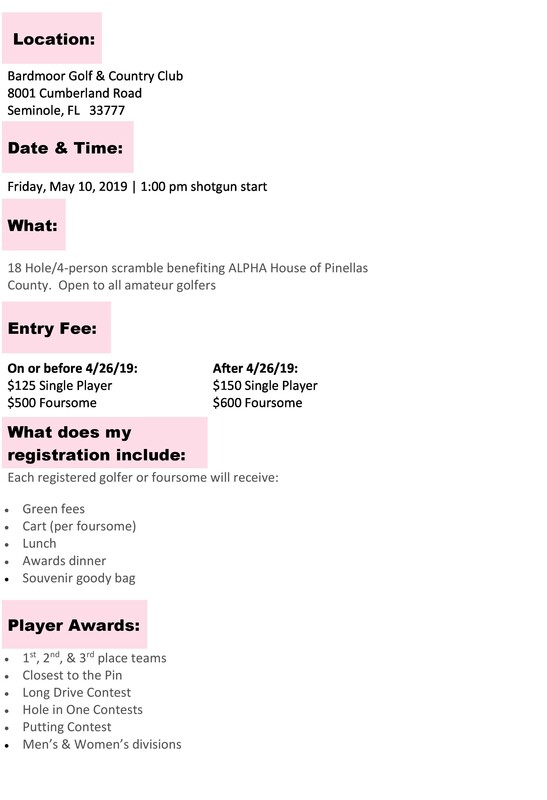 The Mothers, Babies, and Birdies Golf Tournament supports an agency that makes a difference in our community….ALPHA House of Pinellas County, Inc. Since 1979, ALPHA has provided housing and supportive services to over 3,700 homeless, pregnant women and teens with infants and families. By participating in our golf tournament, you will be helping homeless, pregnant women to become self-sufficient, responsible parents, and contributing members of our community. ALPHA House is Pinellas Country’s only residential maternity program.